The bacterium Acinetobacter baumannii has been dubbed "Iraqibacter" because of its prevalence in U.S. military medical facilities. 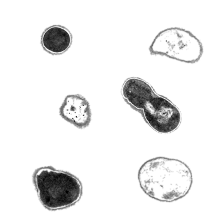 Seen here via electron microscopy, the bacteria lack the flagella many other bacteria use for transport. Image courtesy of Brooke Napier. Colistin is a last-line drug for treating several kinds of drug-resistant infections. When bacteria become resistant to it, they also become resistant to antimicrobial substances made by the human body, microbiologists have discovered. This cross-resistance could mean that patients with life-threatening infections of multiple drug-resistant bacteria, such as Acinetobacter baumannii, are also saddled with a crippled immune response. The results were published May 21 in mBio®, the online open-access journal of the American Society for Microbiology. The findings underscore the need for newer, better antibiotics, says senior author David Weiss, PhD, assistant professor of medicine (infectious diseases) at Emory University School of Medicine and Emory Vaccine Center. The first author of the paper is Microbiology and Molecular Genetics graduate student Brooke Napier. Colistin works by disrupting the inner and outer membranes that hold Gram-negative bacterial cells together, Weiss says. It works in a way that is similar to two substances produced by our immune system called LL-37 and lysozyme, which help defend the body against bacterial attack. LL-37 is a protein found at sites of inflammation, and lysozyme is found in numerous different immune cells and within secretions like tears, breast milk, and mucus. Weiss and collaborators from Emory, the CDC, Walter Reed Army Institute of Research, and Grady Memorial Hospital in Atlanta examined A. baumannii isolates from patients around the country. They found that all the colistin-resistant strains harbored mutations in pmrB, a regulatory gene that leads to the modification of polysaccharides on the outside of the cell in response to antibiotic exposure. Tests showed a tight correlation between the ability of individual isolates to resist high concentrations of colistin and the ability to resist attacks by LL-37 or lysozyme. This was convincing evidence, write the authors, that mutations in the pmrB gene were responsible for cross-resistance to LL-37 and lysozyme. To get closer to a causative link between treatment and cross-resistance, they and studied two pairs of A. baumanii isolates taken from two different patients before and after they were treated for three or six weeks with colistin. The results helped confirm the cross-resistance link: neither strain taken before treatment was resistant to colistin, LL-37, or lysozyme, but the strains taken after treatment showed significant resistance to colistin and lysozyme. (One post-colistin isolate was no more or less resistant to LL-37 than its paired pre-colistin isolate.) Like the resistant strains tested earlier, both post-colistin isolates harbored crucial mutations in the pmrB gene that apparently bestow the ability to resist treatment. The authors note that the apparent link between resistance to colistin and cross-resistance to antimicrobial agents of the immune system could well extend to other pathogens that are treated with colistin, including Pseudomonas aeruginosa and Klebsiella pneumoniae. Weiss says he plans to follow up with studies to determine whether this bears out. For Weiss, the problems with colistin are symptomatic of a larger trio of problems: increasing levels of drug resistance, cuts in federal funding for antibiotic research, and lack of incentives for pharmaceutical companies to invest in antibiotic R&D. "We don't have enough antibiotics, and it's really important for the research community and the public to support increases in funding for research to develop new antibiotics," he says. "We got complacent for a while and the bugs are becoming resistant. This is something we can reverse - or make a lot better - if we have the resources." The research was supported by the National Institute of Allergy and Infectious Diseases (R21-AI098800). Reference: B.A. Napier, E.M. Burd, S.W. Satola, S.M. Cagle, S.M. Ray, P. McGann, J. Pohl, E.P. Lesho and D.S. Weiss. Clinical use of colistin induces cross-resistance to host antimicrobioals in Acinetobacter baumanii. mBio 4, e00021-13 (2013).